By choosing to live in Student Housing, you have opened the door to a world of new opportunities, challenges and learning which will serve you well in all facets of your life! On this page, we provide essential information for residents to learn about your living environment, amenities and services that are offered to you. Additionally, we provide information to help you understand the responsibilities of being a community member. The Office of Residential Life staff comprises full-time professionals and student staffs dedicated to making your stay at student housing productive, enjoyable and secure. If you are interested in working for the housing community, visit the Student Employment page. There are four types of housing at California State University, Northridge. A single bedroom without a kitchen includes two-person bedrooms with a semi-private bath (one bath per two suites). Approximately 16 suites surround a hub of recreational and study lounges. All students in the suites must purchase a meal plan. In a double with a kitchen you share a bedroom with one other student in a two-bedroom apartment, and share the common area in the apartment with two additional students occupying the second bedroom. A majority of students live in this type of housing. In a double without kitchen you share a bedroom with one other student in a two-bedroom apartment, and share the common area in the apartment with two additional students occupying the second bedroom. This apartment has no kitchen and the purchase of a meal plan is required. Please note this choice of room takes precedence over any and all living learning communities and roommate preferences. One- and two-bedroom apartments are for students with dependent children and/or a spouse or partner. Apartments are unfurnished. Kitchens are equipped with a refrigerator, range and garbage disposal. One-bedroom apartments include a dining bar. Two-bedroom units have a separate dining area. Bedrooms contain easily accessible, large closets, and there is a separate linen closet in each unit. Carpeting and window coverings will be provided. When applying online, students may choose to release their personal information to roommates. After you select your room, you can view your prospective roommate's information, as long as they have also allowed this information to be shared. You can contact your roommates before you move in allowing you to get to know them before your arrival and find out what each person is bringing. This makes the check-in process in August more comfortable. Students with disabilities will find living on campus easy. Student Housing works closely with the Disability Resources and Educational Services (DRES) and the National Center on Deafness (NCOD) to support your academic success. Our buildings are equipped with at least one wheelchair-accessible apartment on the first floor of each building, and a few of our buildings have elevators. Service animals are welcome with verification of medical need. Academically motivated students will find the apartment-style housing, study space and academic-focused programming supportive of the individual's needs. The Lighthouse Living Learning Community is where deaf or hard-of-hearing students can choose to live. The Lighthouse is located in Pacific Willow Hall (building 6). There are light flashers in each room in this community and the resident advisors know American Sign Language (ASL). If you choose not to live in the Lighthouse, there are two equipped rooms in each Student Housing building. Interpreters are available upon request for Student Housing events and meetings. Each August, the NCOD holds orientation the week before classes begin. New incoming students who are registered with NCOD move in on Sunday before classes with orientation beginning the Monday. There is an extra fee to move in early, and you must notify the Student Housing office if you are moving in early to attend the orientation. Your ability to be fully invested in your co-curricular experiences; from achieving your academic aspirations through the exploration of course materials to your ability to stay involved in the many events, programs and opportunities while living on campus is the goal of access services. The Student Housing staff recognizes the barriers to an individual's experience that can negatively challenge their growth and development. Your comfort and ability to confidently navigate your experiences within the many social and academic circles is a commitment that we, in Student Housing, work towards everyday. The staff within Student Housing place the utmost importance on understanding and executing best practices and effective structures in place to recognize and remove potential barriers our students may encounter. Access services are available to process your requests for accommodations. With your request for services, the potential for accommodation is limitless. Below are some potential barriers we can accommodate. Communication: Sign language interpreters can be requested for events, activities and roommate meetings. With a 72 hour request policy, you are guaranteed to have ASL interpreters at your requested event. Environmental: Room changes are available due to sensitivities, lighting options or consideration of allergies. Physical: Electric door opening devices can be placed on heavy doors, walkways cleared of debris for easy passage or boards placed under mattresses to make a bed firm. Visual: Enlarged print handouts at programs, lighting options or room selection based on need are available. Emotional Support Animal Request: We value the role animals/pets play in a student’s ability to thrive and overcome with issues regarding mental health, stress, etc. Emotional Support Animals (animals prescribed by healthcare professionals for emotional support) may be permitted in places of residence, upon successful ESA Request form submission and approval by the Coordinator for Residential Student Success. Academic Achievement and Success: Education is the top priority for our students and the Student Housing staff is fully committed to providing necessary resources to advance a student’s educational knowledge and material retention. Through its partnerships with offices including, but not limited to, the Undergraduate Studies Developmental Mathematics Program to the Learning Resource Center, we have created a dedicated space (The SPOT) to providing tutoring services for our residential students. In Student Housing, we see value in celebrating the small success in order to build our students up in greater ways. Students who choose or are assigned to an apartment without a kitchen are required to purchase a meal plan. Any students living in an apartment with a kitchen are welcomed to purchase a meal plan, but it is not required. For questions regarding meal plans, please call (818) 677-2655 or email residential.dining@csun.edu. Parking permits are available for residential students. To purchase your residential parking permit, go to the myNorthridge Portal. Log in to the portal using your CSUN username and password. Once on the portal, select the Financial Matters tab. 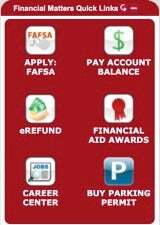 Look for the Financial Matters Quick Links and select the Buy Parking Permit icon. Proceed by following the on-screen instructions. If you purchase a parking permit before coming to campus, be sure it is a student residential permit and not a semester or academic year permit. A student residential permit will allow you to park in the Student Housing parking lots as well as the student lots on campus. Lost or stolen permits must be reported to Parking and Transportation Services. Students are no longer charged for electricity or gas. Utilities costs are now included in your monthly installments. Student Housing residents can get local phone service in their rooms through AT&T. To connect phone service, you will need to sign up for AT&T phone service. There are four phone jacks in each apartment and students contract directly with AT&T for service. Many students choose to use their existing cellphones, as most cellphones receive service in the apartments. If you would like to sign up, you can visit the AT&T website or call (800) 310-2355. AT&T will need to know which phone jack to activate in the apartment. Each phone jack has a letter assigned to it (a-f). Please refer to the tables below to find out which letter corresponds to your phone jack. When ordering new phone service, AT&T will ask you for your street address, which varies depending on which building you live in. Please refer to the table below to find out which address corresponds to your building. 1, 2, 3, 4, 5 9800 Lindley Ave.
6, 7, 8, 9, 10, 16, 17 17950 Lassen St.
11, 12, 13, 14, 15 9757 Zelzah Ave. The Apartments at University Village 10021 Zelzah Ave. Important suites information: If you are ordering service in building 16 or 17, please tell the AT&T representative it is a new address with no prior phone service. If you have any further questions, call the Student Housing office at (818) 677-2160. For additional services or channels please contact 888-696-5526. This will cost extra and is billed to the resident separately. Residential Computing Resources (RCR) services are for Student Housing residents' computers in the housing complex. For network configuration or diagnostics come to the Student Housing offices. RCR does not remove spyware and viruses from student computers. We do not charge any cost for computer diagnostics. The following is a short list of important computing links. Student Housing is proud to offer 802.11b/g wireless network connections to all residents of the Apartments and Suites at University Park. The wireless network allows users to have all the conveniences of a wired network, except now you are mobile! Bring your computer anywhere in housing and most places on campus. If your computer is configured with a wireless card, you can access the wireless network by joining the CSUN network. If you require assistance in configuring your wireless card, you can bring your computer to RCR located in student housing offices, and we will configure it for you. Some services may require a charge. You will be notified prior to having a charge posted on your CSUN account for approval, if necessary. All CSUN students who have a valid user ID and password can access the wireless network. Launch your browser and enter your CSUN user ID and password. If you are connecting for the first time, select csun from your wireless network options. CSUN's encrypted wireless network (Eduroam) requires a one-time login after the initial setup. Please note, this network is an additional resource and does not replace the currently available CSUN wireless network. Gaming devices (e.g., Nintendo, PlayStation, Xbox, etc.) are not compatible. CSUN's non-encrypted wireless network (csun) does not provide a secure connection to the Internet. For a secure connection, you can also use the encrypted wireless network (Eduroam). For help setting up wireless access Please go https://www.csun.edu/it/wireless. Gaming devices are compatible in this network. Please log in to the Student Housing Portal for registering the game console. Please note, operating your own wireless access points or routers constitutes a violation of the Student Housing Computer Network Access Agreement and Campus Network Policies and will result in your immediate removal from the network. Any Windows-based computer running Windows XP, Vista or 7 is capable of connecting to the wireless network. Mac OS X is required for Apple computers. Windows 95, 98, Me and pre-Mac OS X computers are not supported on the housing wireless network. Students, faculty and staff may use the housing wireless network for free. The only potential cost is a Wi-Fi compatible network card, such as the ones mentioned above. New laptops come with wireless built-in, but typically need to be turned on via a hardware or keyboard switch. Please consult your manufacture's literature. Why am I not allowed to run my own wireless network? Personal wireless networks can interfere with the Student Housing wireless network causing other residents to potentially lose their network connections. A one-time $15 optional Residence Hall Association fee is placed on all student resident accounts. The Residence Hall Association (RHA) is an organization of residents acting as agents of opportunity to promote a healthy academic and social environment while voicing the concerns of the community. RHA provides opportunities for development in leadership skills, interpersonal and intercultural growth. If you wish not to participate in this fee, you can opt out via the Student Housing website. Students must opt out no later than 30 days before check-in. There is a $25 charge for lost or stolen keys. There may also be a charge if we are not able to determine whom the key belongs to due to damage. Charges are posted on your student account found in myNorthridge Portal therefor no payment is necessary at the time the key is replaced.Lost keys must be reported to the Student Housing office as soon as possible. Apartment keys: Lost or stolen keys must be reported to the Student Housing office as soon as possible. Room keys reported before 1 p.m. (Monday through Friday) will be replaced after 3 p.m. on the same day. Keys reported after 1 p.m. will not be replaced until the next day. Mailbox keys: Lost or stolen mailbox keys must be reported to the mailroom located in the lobby of building 9. When a mailbox key is replaced, our maintenance locksmith changes the lock on the mailbox. Depending on the time there are several people you can contact to be let into your apartment or suite. Monday through Friday, if you are locked out between the hours of 8 a.m. and 5 p.m., you can go to the business services office. If you are locked out between the hours of 5 p.m. and 7 p.m., you can go to the Community Center. If you are locked out between the hours of 7 p.m. and 8 a.m., you can contact the resident advisor on duty. On-duty phone numbers are located in the doors of each building. Saturday and Sunday, you can contact the resident advisor on duty. On-duty phone numbers are located in the doors of each building. The guest policy upholds the safety and considerate treatment of our community members and property. Residents are permitted to host guests as long as the rights and privacy of the other persons living in apartments and residential halls are respected. The definition of a guest is any person who does not hold a Student Housing license agreement for a bed space in on-campus housing for that particular unit. An overnight guest is defined as any nonresident or resident of another apartment that remains in a residential apartment after 1 a.m. The following are policy guidelines for hosting guests. All roommates must mutually agree about having a guest before a guest may be hosted in the unit. In cases where roommates cannot agree, the right of a person to occupy her or his room or apartment without the presence of a guest must take precedence over the right of a roommate to host guests. No resident is authorized to extend residency to their guests or other students and authorize visitation beyond five nights per 30 day period. There may be a fee assessed for each day of such use in excess of two days per calendar month. Residents must register guests who plan to stay beyond 1 a.m. in the apartment prior to inviting the guest into the apartment. Registration forms can be obtained at the Residential Life office. Residents may be assessed a fee for any non-registered guests found to be inside the residence after 1 a.m.
A resident who hosts a guest is responsible for the guest's conduct at all times and any damages incurred by that guest. All guests must comply with all university and residential life policies. Guests may be asked to leave the premises for violations or to provide identification. The guest must comply. Failure to do so will result in a request for police assistance. The host must be with the guest at all times. Guests are not permitted to be unescorted and may not be left unattended in the host's apartment or in the community. Occupancy in any apartment at any given time must not exceed 10 people, including residents. Soliciting for open parties or gatherings is not permitted under any circumstance. The following methods are available to report problems to the maintenance department. The maintenance department will respond as quickly as possible, as they must prioritize tasks in the student-housing complex. Priority items include heating, air conditioning, running water that cannot be turned off, broken door locks and broken windows. Items such as broken blinds, light bulbs or window screens may be delayed if there is a higher demand on the staff. The maintenance department usually completes a work order within 36 hours. The staff works Monday through Friday and is available for emergencies during evening hours and on weekends. All after hours and weekend emergencies must be reported to a resident advisor, who will then contact the maintenance staff. Mail Services, and mailboxes for residents in the Park, are located in Pinon Hall (Building 9). The Mail Services office is open from 9 a.m. to 6 p.m. Monday through Friday. Students in the Apartments at University Park are assigned to a combo mailbox. Residents of the Apartments at University Village are assigned to a mailbox with a key. Letters, magazines and small packages will be delivered directly to the mailboxes. For all other packages, students will receive an email notification. Bring a picture ID (e.g., driver's license or CSUN ID) to the mailroom to pick up a package. The mailroom staff will not release a package without first verifying ID. Payments may be submitted online, in person at University Cash Services or by mail to the following address. To make a payment online, go to myNorthridge Portal and log in using your CSUN login and password. Online payments can be made via e-check, MasterCard, American Express or Discover. Students must cancel their license agreement if they decide not to live in Student Housing at CSUN. There is a cancellation process and a request for cancellation should be submitted at least 30 days before the requested cancellation date. The cancellation form can be found in the Forms and Service Requests section of our website. If a student decides he or she does not wish to live in Student Housing at CSUN, he or she must submit a cancellation before July 21st. If the Student Housing office receives a cancellation after the date stated above, a pro-rated amount will be charged to the University Student Account for insufficient notice, which will be deducted from any refund received from the university. After a student moves in, any cancellations approved will have a cancellation date up to 30 days after the date the cancellation was submitted. Students are financially responsible for all housing charges up until the cancellation date, including any Student Housing payments, utilities, lost keys, damages, etc. Students must cancel their license agreement if they decide not to live in Student Housing at CSUN. There is a cancellation process and a request for cancellation should be submitted at least 30 days before the requested cancellation date. The cancellation form can be found in the Online Services and Forms section of our website. If a student decides he or she does not wish to live in Student Housing at CSUN, they must submit a cancellation before December 22. If the Student Housing office receives a cancellation after the date stated above, a pro-rated amount will be charged to the University Student Account for insufficient notice, which will be deducted from any refund received from the university. During the summer, cancellation requests are reviewed on a case-by-case basis. The requirement for students to live in Student Housing is relaxed and a student does not need to be enrolled in classes to contract with us. Students who apply for summer housing should consider this fact before submitting a license agreement. Students who receive financial aid get a financial aid award letter over the summer. The letter confirms your accepted award amount for each semester. If your award is over $4,800 for the fall semester, you can mail a copy of your financial award letter to Student Housing in lieu of the installment payment on July 21. Financial aid automatically pays tuition and fees first, with any leftover money going for housing. If you are awarded enough financial aid to pay for the full fall semester and there is a credit balance remaining, you may receive a financial aid refund. If you do not receive enough financial aid to cover all of your tuition and housing, you are responsible for the balance of the amount due. If you receive a financial aid refund check larger than anticipated, check your SOLAR account to be sure all of the proper charges have been placed on your account. Occasionally, financial aid is posted to your account before all of the semester's charges are posted. The following simple math calculation will help you determine if all of your semester charges were covered by your financial aid. Financial aid award minus tuition minus fall housing charges equals your financial aid refund, if any. Whenever you receive a financial aid refund, check your SOLAR account to ensure all anticipated charges are reflected before spending the refund on other things. Community standards allow the residents who share a floor community to define standards or rules for how they will treat each other and live together and how they will hold each other accountable if the standards are violated. While community standards can be seen as a product, a list of agreements and expectations, community standards is an ongoing process by which students begin forming a healthy community through dialogue, compromise and commitment. Community standards evolve therefore the process is never finished. Since community standards evolve, they should not be thought of as a task to be completed, but as a means by which interactions occur. An important aspect of community standards is discussing and deciding how students will hold themselves accountable for agreements and expectations. Discussing the issue of responsibility and accountability of each resident to every other resident can be difficult. Many of students believe someone else (i.e., a Residence Life staff member, public safety, etc.) is responsible for making sure they get exactly what they want. Many of students do not want to stand up for themselves. Equally difficult is the thought of holding a peer to a standard. In Residence Life at CSUN we believe you, college students, are maturing adults. This means you are making choices and learning from the outcomes of your choices. The young adult years are perceived as years of freedom, experimentation, limit finding and limit testing. If the experiences during these years are to lead to an increased ability to make mature judgments then you must have the opportunity to make decisions, so you can experience the result of those decisions. An important area of decision making for college students concerns lifestyle and personal conduct. Traditional college-age people typically reject rules imposed from the outside. They may reject authorities who appear to be trying to deny them their freedom or independence. They may become angry at authorities who don't meet their needs at the time when they want their needs met. Community standards provides a means by which your expectations of the authority to meet your needs are shifted to a recognition that the individual and the community must work together to create an environment that best meets everyone's needs. The authority (in this case, a resident advisor) becomes a person who helps this process happen instead of someone who fixes things for you or someone who always punishes behavior not in line with expectations. If every student lived in perfect isolation, he or she could choose any manner of conduct. In reality, we exist in a tightly networked society. This means our behavior impacts other people and other people's behavior. Because we are affected by one another's behavior, we tend to have expectations about what we consider OK for the other person to do. We may or may not realize our behavior affects others or we may believe everyone has the same expectations we have. This last concept can extend to a point where we believe everyone has the same expectations at the same time (e.g., if I want to listen to music now, everyone wants to listen to music now). If we are to live together in reasonable harmony, we must have the opportunity to express our expectations of how we want to be affected by others. By discussing these expectations you hear the range of expectations and therefore have a harder time holding on to the belief everyone does X or everyone wants the same thing you want. Out of an awareness of expectations, you and your peers can discuss your different expectations and come to agreement on ways you can live with the differences or compromise around the differences. This process may not be easy because it requires many people to achieve new understandings and new behaviors quickly. One of these is the ability to consider another's point of view as being valid thus needing to be taken into consideration in one's own point of view. The context of learning created by the community standards discussion can be a powerful tool to encourage student development and a healthy community. It can encourage students to build self-esteem through declaring themselves, assertive interactions and the empowerment coming from group agreement. By establishing community standards and shared responsibility, students are empowered to deal with problems before they occur. What about Residence Life, university policies and procedures? We still will have policies and procedures by which all residents must abide. They represent the basic safety and management issues necessary to assure reasonable quality of life for all residents. Primarily they establish minimum behavioral expectations and are in agreement with local, state and federal laws. Community standards do not replace these nor may they violate these. These policies and procedures are of such basic nature they should not impede a community's ability to create the standards they desire. How are community standards developed? Community standards are developed through group discussion and consensus. Through this format each resident is afforded the opportunity to assert his or her point of view. An underlying tenet of this system is the belief that in order to have one's needs met, one must accept responsibility for participation in the system designed to negotiate one's needs. Through implementing the community standards model, we are providing the opportunity for you to learn you are responsible for your experience, and you are not simply passive recipients of your experience. Recognition of this concept leads to personal empowerment. Information about Family Educational Rights and Privacy Act (FERPA) and community standards for parents can be found on the Parents and Guardians page.